The abrasive blast media reclaim system is comprised of a floor reclaim and an abrasive separator. The media reclaim floor design can vary from simple “sweep-in” designs to “full” floor reclaims which recover all the abrasive through a grated floor. Abrasive media reclaim designs vary based on the manufacturer and type of abrasive that is being reclaimed. When a very light abrasive such as small glass beads or a fine aluminum oxide (i.e.-120 mesh or smaller) is being used, the most common method of media reclaim is a vacuum floor and cyclone separator. This method is also used in most hand cabinets that use suction or pressure blasting. The most reliable and cost effective method of reclaiming is the mechanical screw floor with a belt and bucket elevator, rotary scalping drum, and air-wash separator. There are four (4) different designs for an abrasive media reclaim floor. They are single screw, “H”-shaped, “U”-shaped and full reclaim. The selection of the proper design is based on production needs as well as economic concerns. A single screw partial reclaim system is the most economical floor design available. The system contains the major components found in abrasive media reclaim systems including metering shed plates, heavy-duty screw, belt and bucket elevator, airwash separator, perforated plate rotary scalping drum separator and abrasive storage hopper with a caged man ladder and handrail. This reclaim package can be expanded to an “H”, “U”, or full floor reclaim design. This floor design is for low to medium production levels. The “H”-shaped partial reclaim system adds two longitudinal metered screw assemblies along each side wall of the blast room. The position of the screw assemblies allows the abrasive delivered from the blasting nozzle, which is either blown or rebounded off the work piece, to strike the side walls and fall into the screws, reclaiming approximately 60-90 percent of the abrasive blast media. The remaining abrasive on the floor is pushed into the screw assemblies at the end of the work shift. The screws are protected from an overload by metering shed plates. The “H”-shaped floor design is typically utilized in a “flow thru” room configuration where heavy work pieces or material handling devices can drive into the room and position the work piece on the steel covered concrete floor located between the screws. This floor design is best suited for medium to high production. The “U”-shaped partial reclaim system adds two longitudinal metered screw assemblies along each side wall of the blast room and positions the cross screw along the back wall of the blast room. The position of the screw assemblies allows the abrasive delivered from the blasting nozzle, which is either blown or rebounded off the work piece, to strike the side walls and back wall of the abrasive blast room and fall into the media reclaim system. A “U”-shaped floor design will reclaim 60 to 90 percent of the blast media. The remaining abrasive on the floor is pushed into the screw assemblies. The screws are protected from an overload by metering shed plates. The “U”-shaped reclaim floor design is typically utilized in an “in-out” room configuration where heavy work pieces or material handling devices can drive into the room and position the work piece on the steel covered concrete floor. This floor design is best suited for medium to high production. The full floor reclaim system utilizes multiple screw assemblies to create a fully automatic abrasive media reclaim floor system. All the abrasive that is blasted is returned to the separator system. The full floor reclaim design requires that the material handling of the work piece be intricately designed into the configuration of the room. Material handling of the work piece includes a work car/track system, an overhead monorail crane, an overhead bridge crane, or heavy-duty floor grating and support steel sized to allow a forklift to drive onto the media reclaim floor. The full floor reclaim design can be used with any room configuration. 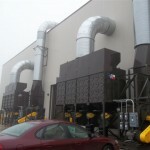 This system is best suited for high production requirements. The partial floor reclaim systems will have an added “clean-up” cost associated with the Return on Investment that must be calculated into the justification for Capital Expenditure. Choosing the right floor configuration to best meet production and cost requirements will result in the quickest return on your investment. 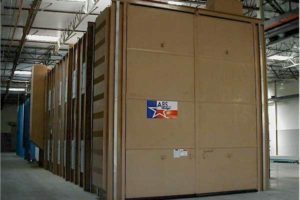 The material handling method of moving the work piece through your facility or just through the abrasive blast room must be considered so the room is designed for that specific handling device. As mentioned above, the partial reclaim floor designs lend themselves to forklift trucks or driving the work piece directly into the abrasive blast room, such as construction equipment or trailers. The full reclaim floor design can be configured for a work car track system, overhead monorail or bridge crane system, or a combination of both. The abrasive blast room configuration will vary based on your plant layout and the material handling method for the work piece..
A “flow-thru” room configuration is designed for work to enter one end of the room and exit the room on the opposite end. This configuration is typically used for an “in-line” production flow of the work pieces. A “flow-thru” design requires more floor space in your facility, in that you typically allow for an in-bound and out-bound staging area prior to the next production phase, such as paint. An “in-out” room configuration is designed for work to both enter and exit the same end of the abrasive blast room. This configuration is typically used because of space or production flow considerations. 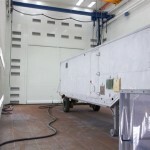 The abrasive blast room and paint booth are usually side-by-side. This configuration allows for both rooms to be presented the work piece from a variety of sources and directions, while minimizing factory floor space requirements. The amount of abrasive blasting that is done in an 8-hour period and the number of blasters required for that production level is another factor that dictates a blast room design. 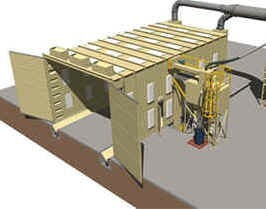 For example, if you are currently operating with four (4) blasters in an outdoor sandblasting operation, you will require an abrasive blast room with enough room, abrasive capacity and reclaim equipment to accommodate this production level. The abrasive media reclaim systems and room designs will vary in size and capacity based on production levels. SURFACE COND. SQUARE FEET PER HR. A properly designed abrasive blast system will provide your company the tools it needs to meet the demands for a clean environment as well as providing a good Return-On-Investment. Recycling blast abrasives saves money by reducing waste. 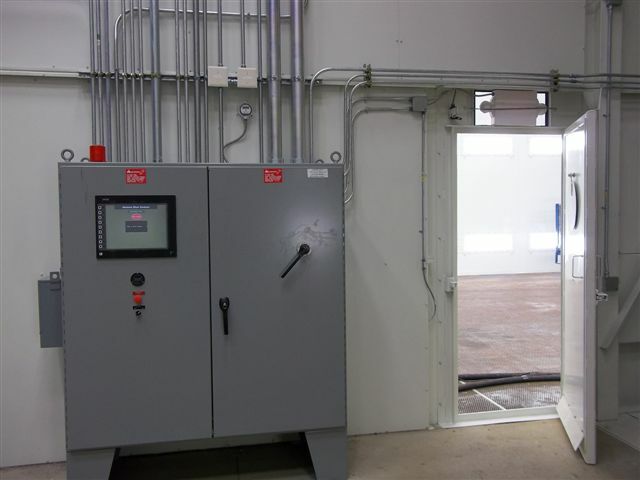 The enclosed blast room saves money by allowing production to continue regardless of outdoor weather conditions. 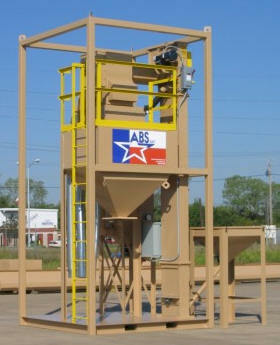 ABS Blast offers a full spectrum of abrasive media reclaim system designs and room configurations. From economical single screw partial reclaim floors to highly efficient full floor reclaims, Contact Us and ABS Blast will help you design a solution uniquely tailored to your production and economic needs. For example, a job shop blasting operation may see one type of work for a period of time and another type of fabricated aluminum parts for another period of time. In this type of application, you would want to select a type of abrasive that is applicable to both types of base material (i.e.- steel (ferrous) and aluminum (non-ferrous), such as garnet, star blast, aluminum oxide, etc. While a mineral abrasive gives you the flexibility to accept a variety of work into your shop, it does break-down at a much faster rate than steel grit abrasive. Typically, you can recycle mineral abrasives about 3-6 times, based on operating pressures at the nozzle and the initial size and hardness of the abrasive. Steel grit abrasive also comes in a variety of sizes and hardnesses. The typical recycle rate for steel grit (G-40) is 150-200 times. Again, this can vary based on operating pressure at the nozzle. Disposal costs of spent abrasives are a major factor in abrasive selection. The amount of waste that must be removed is directly related to the recyclability of the specific abrasive and the volume of abrasive that is used. This can result in a large quantity of waste material that must be dealt with in regards to “cost of disposal”. This cost will vary based on the blasting operation and coatings being removed. If lead paint or zinc primer is being removed, the disposal costs can be up to $500 per 55-gallon drum of waste. 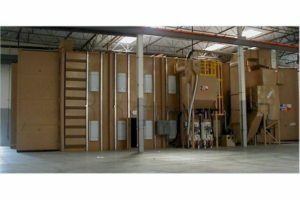 The Return-On-Investment (ROI) for a blast room facility is the key element when making the investment in a blast room facility. Recycling abrasives and minimizing waste disposal costs is the single most important element in achieving a good ROI on the capital purchase. Contact ABS Blast and let us help you in determining the right Abrasive Blast Media for your specific needs. 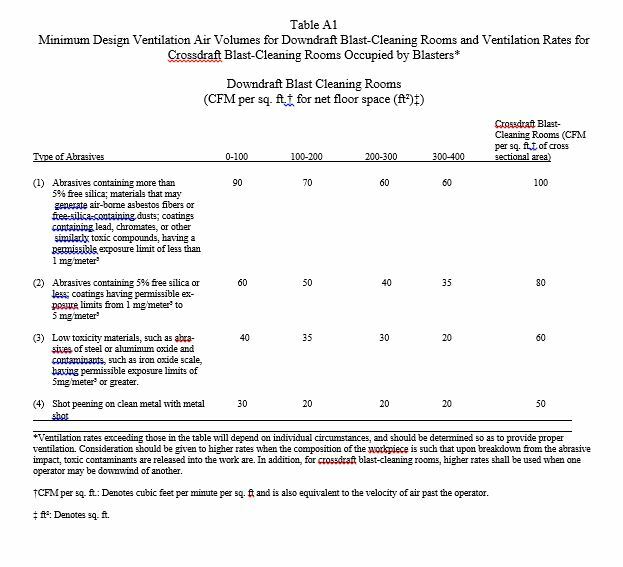 Ventilating a blast room can be done by three different methods of air-flow design. 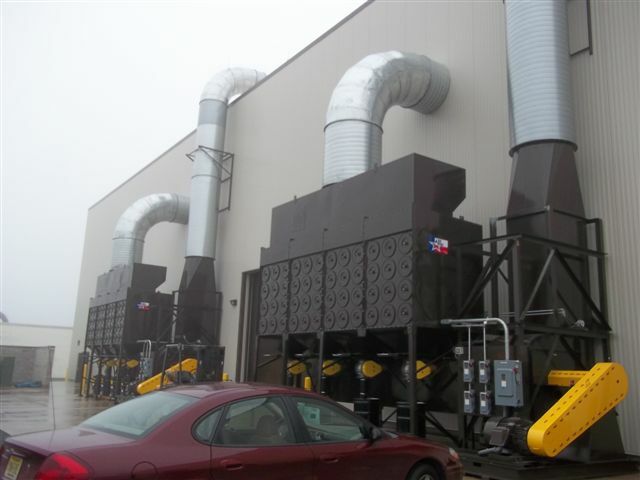 The three air-flow designs are “down-draft”, “end-to-center” and “cross-draft” ventilation. The various room air speeds are determined by the abrasive that will be used in the blast room and the method the room is to be ventilated. The chart below is provided by ANSI and outlined in ANSI Z9.4-1985 – “Abrasive Blasting Operations – Ventilation and Safe Practices”. Width of room x Height of Room x Cross Sectional Air-Speed (FPM) = C.F.M. Note: The cross sectional air speed is typically 50 f.p.m. for steel grit abrasive and 60 f.p.m. for non-ferrous mineral abrasives. 16’ x 16’x 50 f.p.m. = 12,800 c.f.m. required for a room air-flow rate of 50 F.P.M. 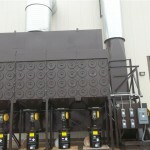 The reclaim system adds an additional air volume to the dust collector that will range between 500-1200 c.f.m. 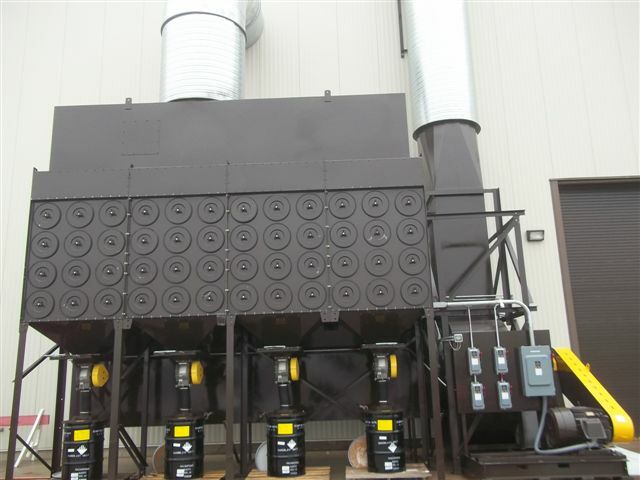 ; therefore, the resultant dust collector will be sized for (12,800 c.f.m. + 500 c.f.m.) – a total of 13,300 c.f.m. There is obviously a lot that goes into building an Abrasive Blast Room. From room size, to proper ventilation. Let ABS Blast’s extensive experience in Blast Room Design help you determine the best design specs to suit your specific needs. Contact Us today for a free quote and see why ABS Blast is an industry leader in Abrasive Blast Room Technologies. Abrasive blasting has been around for as long as man could throw a mineral abrasive, such as silica sand on to an object. The reasons for the surface preparation vary from removing an existing coating to preparing the surface to accept a new coating. The idea is simple and the industry was born with the advent of the air compressor. 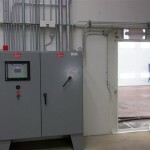 An abrasive blast room is the core to any modern abrasive blast system. Confining the blasting operation to a controlled clean environment enables efficient abrasive recycling. 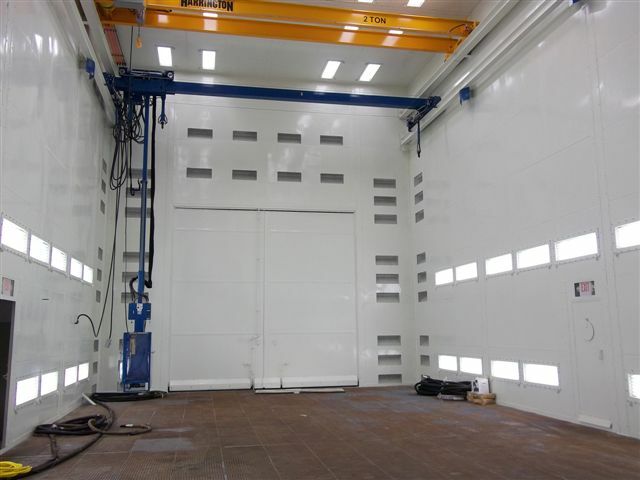 The design criteria required for a properly sized blast room system includes the size of the largest work piece, weight of the largest work piece, material handling method, the number of hours of blasting per day, and the base material of the work piece. Each of these items needs to be addressed in order to finalize the configuration of the blast room. 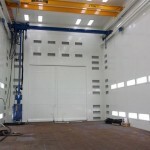 The size of the largest piece will determine the dimensions of the blast room enclosure. The width of the room is determined by adding 4-5 feet on each side of the work piece. This space is required for the blast operator to maneuver around the part and blast the part from various angles. The height of the blast room is also determined by the work piece height; but the material handling of the part must also be considered. For example, if a work car on a track is the material handling method, then the height of the work car must be taken into consideration to determine proper clearance of the blast room roof panels. Again, a 4-5 foot clear area will be required for the blast operator or up to 7 feet clear if the operator will walk on top of the part while blasting (e.g.-a tank in the railcar industry). Likewise the length of the blast room is determined by adding 4-5 feet on each end of the work piece to allow for operator clearance. Proper planning and design of the blast room results in the best built rooms suited to your specific needs. ABS Blast has the experience and expertise needed to assist you in all steps of your blast room design and build. Contact Us for your Abrasive Blast Room needs and let our quality of work speak for itself. 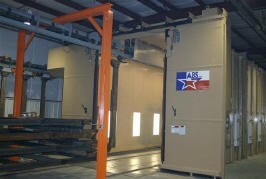 ABS Blast has recently completed an installation of a full floor abrasive blast room facility. The installation is located at the United States Marine Corp Facility located in Okinawa, Japan. 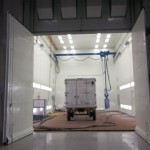 The newly installed abrasive blast room enclosure measures 20’w x 18’h x 50’l. 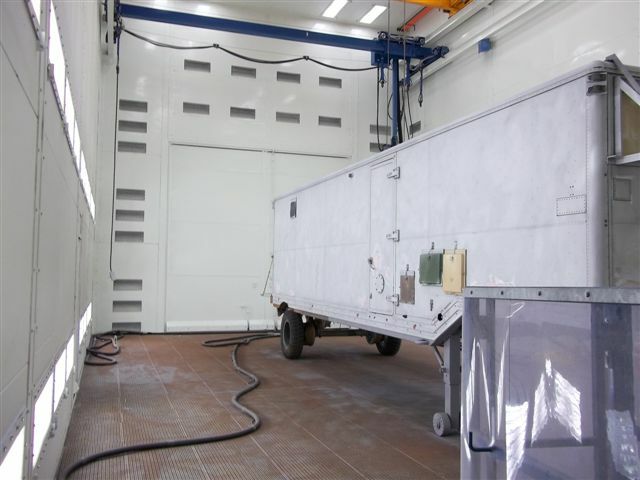 The abrasive blast room set up makes use of Garnet abrasive blast media in order to safely and effectively blast military vehicles, and maintenance equipment. At ABS Blast, we understand that in today’s economy, budgeting is essential. We take into consideration the use of any existing equipment, facilities or equipment. 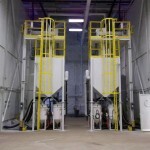 For this installation the abrasive blast room was constructed inside of the existing blast building. In order to accomplish this, this blast room makes use of a pit-less abrasive full floor reclaim system, which allows for the new installation to be constructed over the existing slab of the old blast room. This type of an abrasive recycling system installation allows for a more cost effective and efficient installation process. For this project all of the corresponding abrasive blast equipment, including the dust collector, is positioned behind the blast room, and remains inside of the main building. This type of arrangement allows for an efficient use of space as well as protects the valuable abrasive blast equipment from the elements. ABS Blast takes pride in our quality of product and workmanship. As such, ABS Blast is proud to add this abrasive blast system installation to our lineup of over 2500 completed projects world-wide. Our team of experienced professionals, our industry experience and our superior quality of work is what sets us at ABS Blast apart from the rest. Contact us for a Free Quote on your abrasive blast needs and see for yourself why ABS Blast is the worldwide leader in Abrasive Blast Room Technology including Blast Room Design and installation. ABS Blast has just completed one of the army’s newest and most advanced blast and paint facilities in the country. In addition to the technology used in the completion of the project, this was also a LEED Program Project. ABS Blast used 85% recycled steel in the construction of the blast room structure, as well as a heat recovery system to return heated air to a heat exchanger that was utilized to heat the main blast and paint building. The blast room was constructed of double sided panels with noise dampening material “sandwiched” between the heavy gauge steel sheets. The result is a blast room operation that is whisper quiet. The blast room operators can move around the parts via two (2) telescoping gantry manlifts allowing five axis travel to access all areas of the part without having to get out of the work platform. This reduces both worker fatigue and risk of injury due to re-positioning of ladders, scaffolding, etc. The room includes a 2-ton bridge crane with remote control operation and a heavy-duty floor system rated at 48,000 lbs. per sq. ft. Parts can be driven into the room or brought in by heavy-duty forklifts. Various parts can be lifted with the crane to access areas that need to be blasted. ABS Blast leads the industry in innovation and design. Let use help you design the blast facility that best meets your needs. Abrasive Blast Systems will be at FABTECH to Demonstrate our Blast Room Technology Abrasive Blast Systems will be in Chicago next week for FABTECH, the biggest annual event for blast room technology. This year, FABTECH will be held at the McCormick Place November 14th to November 17th. The event will bring in over 30,000 visitors from all over the world who are interested in blast rooms and abrasive blast equipment. FABTECH is the premier event for metal forming, fabricating, welding, and finishing, as well as blast rooms and blasting equipment. FABTECH gives attendees all the information they need to improve their blast rooms, along with many other tools to increase their business potential. While in Chicago, we will demonstrate how we design and provide the best blast room solutions in the industry. 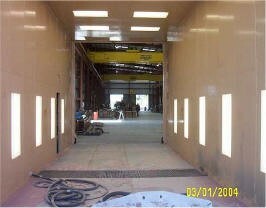 We have completed over 200 abrasive blast room projects in the United States and abroad. 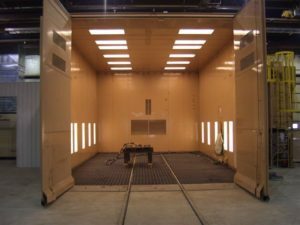 Our blast rooms are used in many industries including automotive, construction, military, petrochemical and more. These industries use our blast rooms as part of their construction, renovation or repair processes. Abrasive Blast Systems will show FABTECH attendees the technology behind our well designed blast rooms, as well as our blasting equipment. 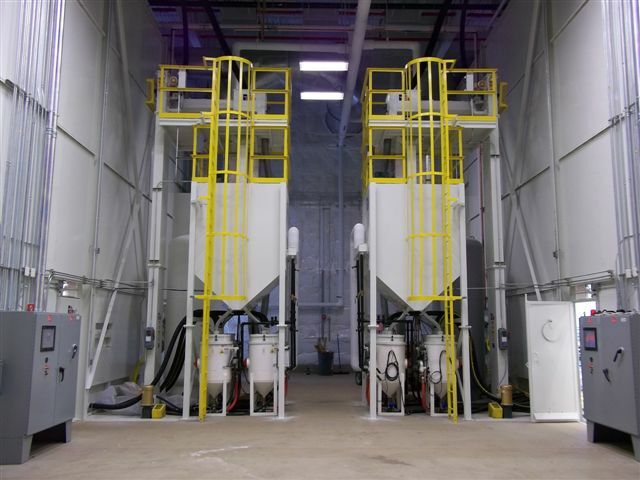 Our blast rooms are a clean and efficient way to control abrasive recycling. 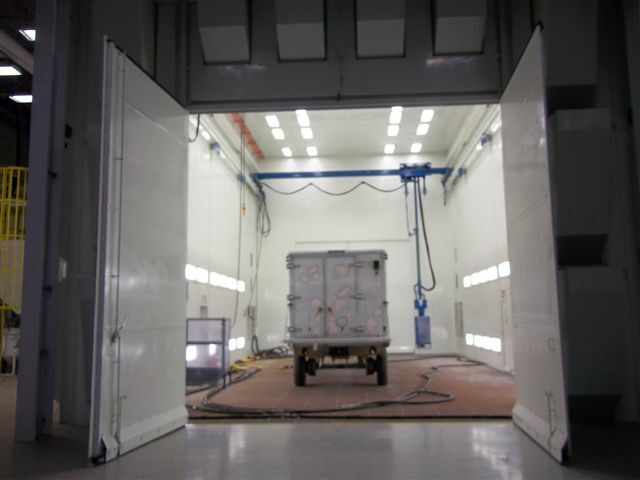 We will also demonstrate how our blast rooms begin with a simple understanding on the size of the items that need an abrasive blast, and how our blast rooms include the highest quality features and construction. If your company is in the market for a blast room or you are in the Chicago area, stop by FABTECH. We will be located in Booth 4041 providing all the attendees with valuable information about our blast rooms and blasting equipment. If you cannot make it to FABTECH, make sure you visit our website for more information on our blast rooms. We hope to see you there. The Portable Reclaim Abrasive Module or P-RAM 50 is a self contained, weather tight, high production abrasive reclaim module with the ability to clean 160 cu. ft. of dry abrasive per hour. This Abrasive Blast System (ABS Blast) reclaim unit includes a “super sack” bulk feed hopper, heavy-duty belt and bucket elevator, perforated plate rotary scalping drum, air-wash separator, self cleaning two (2) deck vibratory separator and a 50 cu. ft. abrasive storage hopper. The P-RAM comes fully assembled and wired to a NEMA-4 control panel with a “plug-in” power arrangement. For more information on the P-RAM 50 or other Abrasive Blast Systems or components, please contact us by e-mail or phone.